Casian's passion for sport started at a young age – and continued into adulthood. Before undertaking his degree Casian played basketball at a national level for his home country, Romania. He continued playing basketball here at LSBU and was named as the University's Sportsman of the Year. Casian showed the same passion and dedication for his studies as his sport – and his first class degree in Sport and Exercise Science BSc (Hons) confirms that his hard work paid off. Casian has recently graduated and is now going on to study a Sports Therapy postgraduate master’s degree. Casian grew up and studied at a sports high school in Romania. He notes how the adjustment to self-directed study required at university was tough, but is now something that he relishes and finds extremely rewarding. Casian now knows that he wouldn’t want to study and live anywhere but London. His experience of London, the University, and the people made him feel welcomed, challenged him to grow as a person, increased his independence and encouraged him to pursue his goals. With a dream to open his own rehabilitation clinic, Casian's studies at LSBU have helped him specialise and learn in-depth subject knowledge. He recalls how his dissertation explored the field of biomechanics and specifically focused on a somewhat misunderstood condition and injury (one that has plagued Casian since a young age) chronic ankle instability. "My dissertation was in electro muscular stimulation of an intrinsic foot muscle in chronic ankle instability. I’ve had this condition throughout my whole basketball career, and LSBU has given me the opportunity to learn in more detail about my injury, possible causes and ways to improve stability with the foot and ankle." "Sport Psychology was an area that I knew a little about, but Nadia Gaoua made the course much more enjoyable and engaging. She prepared us ahead of lectures and seminars by providing us with reading and materials so that we used our time in the classroom. We explored how the mental state of an athlete can affect their performance. So, we looked at anxiety, focus, and specific techniques around how to control an athlete’s mental state"
Some prospective students can be daunted at the prospect of university and of leaving close friends at home, but Casian found that meeting new people on his course has been one of the best parts of his student experience. "At high school I often found myself socialising with the basketball team, and there was very little interaction with other students from different sports. One of the pleasant surprises at LSBU is how friendly and supportive our class has been over the three years. We’ve developed stronger bonds each year due to our group learning and project work, and I now consider a number of them friends for life." "I’ve no doubt that I’ll continue to stay in touch with the friends I’ve made here at London South Bank University. The academic staff were all great, Steve Hunter helped me with physiology and Dr Rita Oliveira offered invaluable advice on skills development. All the staff will continue to be a great source of knowledge as I continue to pursue my dream in sports rehabilitation." 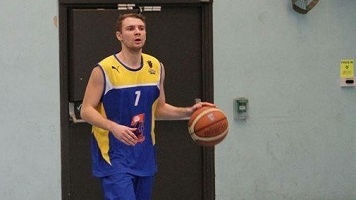 Casian played basketball at national level in Romania and continued to play throughout LSBU as an elite althlete. He was named LSBU's Sportsman of the Year and was a student representative. Even after graduating Casian will continue to be a Sports Ambassador for LSBU, representing the University at various sports events. What’s Casian’s advice for any prospective students?